Not the athletic kind of runner — it’s the coffee table kind I’m talking about. With the yarn left over from the Tiny triangles top project, I decided to first do some cross stitch, something that I haven’t done in a long, long while. Yarn that still remains after the cross stitch project — and there’ll be plenty left — will be used in a crochet project that has been kinda forming in my head. So I dug up some old cross stitch supplies — aida cloth and embroidery hoop from about fifteen years ago, I think. 😮 I’m surprised the fabric’s threads are still strong. There were also a few skeins of random colors in that bag, and I definitely need to use them sometime (but not for this project.) The cloth is big enough for a runner or two, and I thought I’ll make one for the coffee table in our living room. Anyway, while I wait for inspiration to strike, I’ve finished making an edging for the runner to help prevent future unraveling of the fabric. It’s Lemony because of the beautiful bright-yellow color of the yarn. I started this project because I wanted something different to do while I was trying to finish other projects. 😀 Some of those other projects are still not done, but this wrap finished up pretty quickly. I first started with the top-down approach without any pattern in mind, working short rows coupled with increases until I reached a decent height, and bound off, only to realize that the yarn is pretty heavy, and it stretched the shawl so much that it looked like I was wearing a python. So I frogged it and started afresh, this time quite narrower. I still wanted to stick to the top-down construction, and started off with a simple lace pattern at the top. This time, I thought of looking for some inspiration for a lacy bottom edging that I could play with. I’ve mentioned before that I’m not great at designing with eyelets and laces, and I thought I could practice a bit now. I came across the Annis shawl pattern by Susanna IC on Ravelry. The instructions were for a bottom-up shawl, though, so I thought this is my chance to try to convert it to a top-down one and see if it looks the same. I tried and tried with quite a few combinations of yo, k2tog and ssk, but it never really looked the same. Sigh! I’d had enough of searching and experimenting, and just picked the best-looking one from amongst my tries — I had already made much of the shawl and didn’t want to frog it all over again to restart it bottom-up. My friend KG has asked me to knit a sweater for her. I’ve not worked on a large project for someone who’s not immediate family, but thought I could see how it goes. 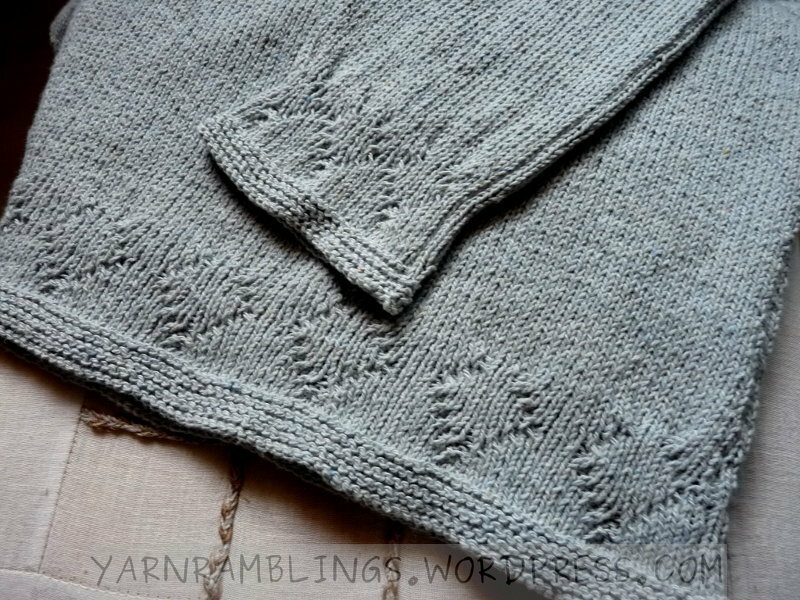 I haven’t blogged about the sweater’s progress, though, and KG checked with me last week about it. She’s given me a deadline, you see… 😉 😀 Now that most of the difficult initial work — thinking of a pattern, swatching, designing parts from reference measurements — is done, the actual knitting is coming along… slowly. I don’t do things for long periods these days because my eyes feel the strain and fatigue at times — my day job also involves staring at a computer screen most of the time. 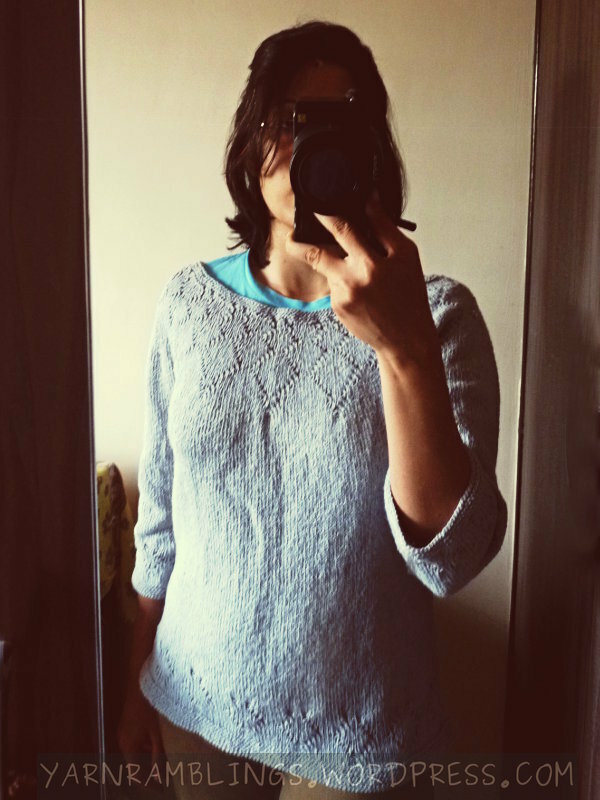 Diamond Yoke Pullover — done! A very high-contrast picture indeed! 😛 Regardless of the quality of the picture, I’m happy with how the project itself turned out. I stopped working on the sleeves before they could reach the wrists, so it’s more like a top than a pullover; but hey, I’d had enough of working — twice — with this inflexible (figuratively speaking) yarn so anything that looked decently wearable was good enough for me. Though I speak as if I would kick this yarn out the first chance I get, it’s really not that bad a yarn if I think about it. (Or maybe I just feel that because everything looks funny, or at least harmless, in hindsight.) So just to prove to myself that the yarn is actually a nice little obedient one, I made an extra something from the leftover. But more on that later. I’ll concentrate on the sweater now. I really like how the design has turned out. (Probably because it’s my own design, hehe…) Remember how I said in my previous post that I’d started out this pattern as a cable pattern, and decided to make the reverse side as the front? So yeah, I just knit it on the wrong side to keep things simple for myself. So it’s mostly purl stitches in this knit-in-the-round pullover. I’d originally intended to keep the bottom of the pullover simple and without a pattern, but seeing from experience how this yarn does not show designs very well, it made sense to add a row there. Of course, the sleeves got their due share of the pattern too. I made the neck wide, and that shaped out well. I finished the piece with garter stitch borders. It’s simple, but I think it’s effective for this piece.